Silently the Lone Hunter emerged from the shadows. 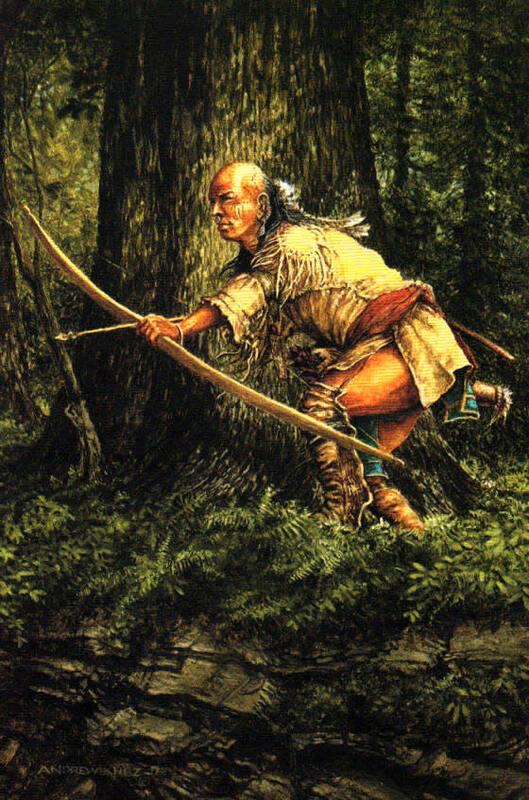 The Eastern Woodland Indians continued to use bows and arrows on a limited basis until well after the conclusion of the Revolutionary War and the Border Wars of western Virginia and West­ern Pennsylvania. The rifle or musket was the weapon of choice, but bows and arrows were used when silence was prudent, such as when traveling and hunting in enemy territory and in battle as a siege weapon to shoot over fort palisades and to send flaming arrows into wooden fortifications. Sinew which was used for bowstrings and to tie feathers and arrowheads to shafts was very susceptible to the rav­ages of water, so they usually used a waterproof animal skin sheath with a flap for convenience and protection. By the late 1700's, arrow tips evolved from labor intensive flint heads to anything sharp and pointed, such as nails and hammered pieces of discarded steel or brass. Bows were gen­erally slightly shorter than the warrior was tall. Short bows came into general use on the western plains when hunting and warfare was done from horseback. When pursuing buffalo, the hunter could shoot seven or eight arrows in the time it would take to reload a muzzle loader.